The client wanted to present this farewell gift to this lady who will be migrating to UK to be a 'Tai Tai'. In fact a housewife, as she used to have a maid in Singapore, but not in UK. 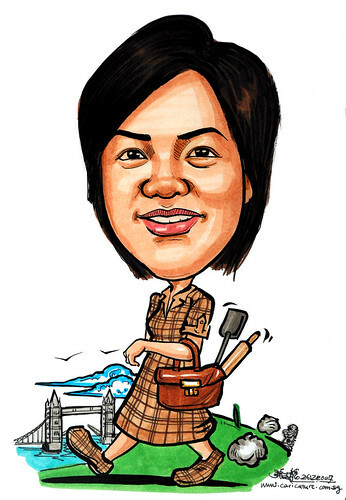 Hence, I drawn in some cooking utensils in her handbag, while she is shopping in her Burberry suit. Background is the London Bridge and Merlion. the bridge in the background is called Tower Bridge, where the Crown Jewels are guarded by the Beef Eaters. London bridge is a small plain looking bridge which is about a street away.